Jute is a rain fed crop, which doesn't require any harmful pesticides and fertilizers during cultivation. The jute is a major export-oriented industry of India, providing employment to around 5 million people in the poorest regions on earth. Products made up of jute are widely demanded throughout the world by environmentally conscious people. Jute storage storage racks are beautifully developed by a team of experienced craftsman by tightly binding the jute sticks and thread together. Today, people are running after attractive looking racks that are even not durable and eco-friendly to use. To solve this issue, variegated jute products manufacturers introduce jute storage racks that are developed from recyclable material. The jute made racks have longer service life due to their ability to bear weight and flawless weaving of threads with sticks. For meeting the preferences of clients and enhance the beauty of their place, varied firms are offering jute storage racks in attractive designs, shapes, sizes, color shades and specifications. Designing these racks is a tough task, as today everyone want a product, which suits the looks of dÃ©cor. Jute storage racks developed from jute comes in a blend of traditional and contemporary designs for enhancing the appearance of the area, wherever placed. Racks made up of jute are widely appreciated throughout the world because of providing ample storage space. Features like lightweight, intricate designs, elegant looks and alluring patterns have also increased the demand of jute storage racks. One can find use of jute racks in various homes, offices, institutes, libraries and malls for having organized & secure storage. Along with these, storage racks are used in varied worship places like temples and gurduwaras for safely storing shoes and other belongings of people. 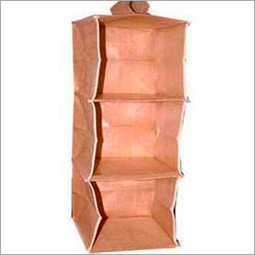 Jute storage racks also find their use in warehouses of various firms & industries for properly storing goods.